When the Great War of 1914-1918 commenced, no one had imagined that the war would be so severe and so long. The Kaiser told departing troops: ‘You will be home before the leaves have fallen from the trees’. On August 4, 1914 German troops marched into Belgium. It took four dramatic years until fighting stopped with the armistice at Versailles. This study tries to reiterate that the fighting in Central Europe, particularly at sea, had not only modified certain weather patterns, but also influenced climatic changes in European and Northern Atlantic territories. The latter will be dealt with in a different paper. Here the possibilities of weather modifications during WWI are discussed. 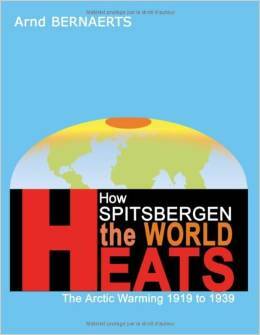 However, the main aim is to link naval activities to the warming at Spitsbergen in 1918 (A). The link between war activities at sea that led to changes in the weather pattern has been quite extensively manifested during the war winters of 1939-42 (B). During the first few months of war in 1939/40, the war machinery was more powerful and acted more forcefully so that the impact of the war on the weather could be identified more clearly (C). In WWI the war at sea first started with full momentum in the autumn of 1916, by accelerated use of sea mines, submarines and counter defence measures on a grand scale. Further details: (A) Spitsbergen Big Warming, 5_12; (B) Three-years-package, 3_31; (C) North Sea Cooling, 2_16. For these reasons it is easy to conclude that if the study on the weather making process during the war winters in WWII is not accepted, it seems hardly possible to convincingly a similar connection in respect of WWI with arguments based on conditions observed during 1914-18 alone. That is why this study seeks, through the presentation of the following facts, in addition to the Spitsbergen warming issue, to support the discussion on WWII’s impact on regional weather modification during the war winters 1939-1942 and global climatic change from 1942-1980 by cooling. At least, at this stage of the investigation it should be mentioned that the Baltic Sea was not free of military activities during WWI. 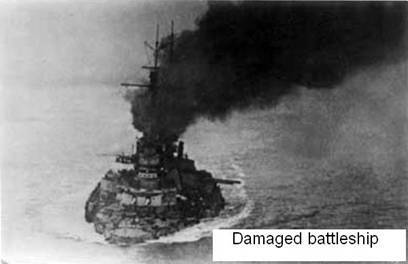 For example, the German submarine U-boat (U-26) torpedoed the Russian armoured cruiser Pallada, which went down with all her 600 men on October 11, 1914. Cruiser Friedrich Carl sank after striking a Russian mine in German home waters on November 17, 1914 : For the Baltic Sea peace had gone for four years. The Russians alone laid 52,000 mines during WWI , in a number of locations, most of them in the Baltic. The Germans laid thousands of mines in the Gulf of Finland to prevent the Russian Fleet from leaving St. Petersburg. It is worth noting that the ice cover in the Baltic increased from 1915 to 1917 (see below: Ice conditions). However, for the benefit of the interested reader some information will be presented in order to enable him to draw his own conclusions or to undertake more research to find further clues. This presentation will therefore be selective to support the general theme of this investigation. Based on available data on the ‘war scenario’, it was considered reasonable to link the fighting along the Western Front, together with other anthropogenic causes, to the abnormally wet autumn of 1939. Such surmises will not be used here (in respect of WWI) astoo little material has been gathered to come to firm conclusions. However, in 1941 Meissnercategorically denied any connections between artillery barrage and rain-forcing, between war activities and changes in weather. He confirms the importance of nuclei for cloud-forming and that bombing would release gaseous ‘nitrate’ in the air abundantly, pointing, as an example, to the fact that forest fires can generate cumulus clouds. Nevertheless, Meissner denies any relevance by referring to the big May offensive by the German General Mackensen against Russia at the East Front 1915, during which the weather remained permanently fine, despite very heavy artillery shelling. Meissner concludes that general weather conditions can obviously not be influenced by war activities. Meissner was obviously not able to link war and rain together. The German attack on Verdun started on 21st February 1916 with a million troops. Verdun, the longest battle of WWI, ended on 18th December 1916. TheFrench Army lost about 550,000 men at Verdun. It is estimated that the German Army suffered 434,000 casualties. About half of the total casualties were killed. At least the regional country Baden, in the South-East of the battle fields of France/Germany reported eight months as having been very wet, while February, June, July and August had been too dry in 1915. In 1916, only March and May were partly drier than the average; the other 10 months had up to 30 % more precipitation, in the Black Forrest even 50-80% more precipitation than normal . In Britain June was very cold and dull. Rain was persistent in the east and north, e.g. with about 150 hours rain in Aberdeen and up to 200 mm. July and August were normal but in September a mid monthly depression moved SE down the east coast and then brought rain and gales to many parts. October was wet and stormy with a record daily rainfall for the month of 200 mm. Up to this point, this was the highest daily rainfall ever for the British Isles. December was extremely cold (details: www.personal.dundee.ac.uk). These conditions show principle comparability with the situation in autumn 1939 (A). Further details: (A) Rain-Making 1939, 2_31. Germany, 1916/17; deviation from 15 year means, in bracket, °C. In the coastal sea areas November and December were about 0.8°C warmer than means average. Baltic Sea; January – April 1917, the most eastern location Memel (Neman) reports: January (-1.5°C), February (-3.7°C), March (-5.5°C), April (-2.6°C). The cold wave in winter 1916/17 was in no way comparable to any of the three war winters of 1939-42, but the winter in Frankfurt was reckoned as having the fourth longest freezing season during the period 1905-41. The following and last war winter of 1917/18 ranks in the middle with regard to the cold period, whereas the next winter of 1918/19 was mild, particularly in December. Actually, in Germany, January 1917 was about 5°C colder than the previous two years, but only slightly colder than January 1914. In Norway, January 1917 was 4-6°C colder than the mean (1841-90), from Oslo to Røros (ca. 200 km north of Bergen); the winter of 1917/18 deviated by minus 1-2°C, with the next winter of 1918/19 in plus (approx. +1°C) (Source: Norwegian official tables). The coldest measured temperature on Spitsbergen until today was -49,2°C, measured in Gronfjorden, March 28th, 1917 (www.npolar.no_“Svalbard Facts”–Site). Britain at that time was one of the most interesting places for looking for clues for climatic changes. In all coastal waters around the island, mining, minesweeping, and sinking of ships had become daily life experience since August 1914. 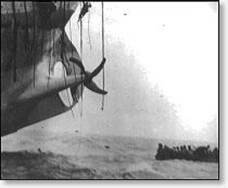 The severity of ‘destruction at sea’ built up gradually, e.g. the first submarines went into action in summer 1915, sinking, on an average, two ships per day, or 100,000 tons ship-space per month and as much tonnage of cargo. During 1916 some 1,840 mines were swept and destroyed by a flotilla of more than 500 vessels that constantly navigated around 1,000 square miles a day. This, however, could not prevent the loss of 131 merchant vessels to mines in Britain’s home waters. The submarines excelled, sinking approximately 1,000 merchant vessels with a tonnage of 1,784,000 in the second half of 1916 . One of the most dangerous newly developed weapons in 1916 was the depth charge, weighing 136 kg . During 1916 the war materials became more sophisticated and the activities at sea grew fiercer . The seas were stirred and water was mixed more and more. Presumably the climate reacted immediately, as figures from the British Isles seem to indicate. War winter 1916/17 became extremely cold in North-West Europe and was the only winter in Britain with three consecutive severe months during the last century with a mean below 2°C (Dec. 1916; Jan./Feb. 1917). The Midlands and South West recorded large snowfalls of up to 14 inches, while Ireland experienced blizzard. It was a heavy snow year for the Highlands. The almost complete comparability between war winters 1939/40 and 1916/17 is evident. Note: The following tables indicate the significance of low temperatures during WWI years in relation to the fairly normal winter values of 1913/14 and the extreme winter values of 1939/40, a winter regarded as the coldest in many decades. Gunton regarded January 1940 as probably the coldest in 100 years. February 1917 is (together with February 1902) the coldest since 1895. The means for three months from December 1916 to January 1917 (108.3°F) is on the same cold temperature level as the first WWII war winter 1939/40 (108.6°F), regarded as possibly the coldest in many decades. The winter seasons (December-February) 1916/17 and 17/18 were both cold. One has to go back to 1891 to find an equivalent cold season. Winter 1916/17 was on par with winter 1939/40 (cold sum: 109 / 107,9). Drummond writes 13 : Since comparable records began in 1871, the only other winters as snowy as the recent ones (1939-42), were those of the last war, namely 1915-16, 1916-17 and 1917-18, snow falling respectively on 23, 48 and 23 per cent of the days, (figures for 1939-42 are 21, 23, 30); the average (1871-1938) is 9 days per winter months (December -February). Means for three months from December 1916 to February 1917 (90.9°F) was only slightly higher than for the WWII war winter 1939/40 (88.6°F). January 1918 was colder than the previous January (1917). Comparing the four months December-March in winter 1918/19 with the corresponding period in winter 1939/40 the cold number of days is almost equal, 126.4 / 123.3 (-°F). Comparing the autumn and winter of 1918/19 and 1939/40 (September-March) the relationship in respect of the total number of cold days (-°F) is 245 / 249.4, as against a usual means of roughly 260 in previous years. At least, the figures given above may indicate that something significant had happened in tandem with the temporary decrease in temperatures. The similarity to the war winter of 1939/40 is obvious. One aspect makes 1916/17 particularly interesting. This particular winter cold in England was not only an appendix to a continental arctic winter, but on a statistical basis, ‘cold on its own conditions’. At that time the Baltic Sea saw much less naval activities and was less ‘stirred and shaken’ by military forces, than prior to the war winters of 1939/40 and 1941/42. This means, the cold was primarily generated in the North Sea. Another important aspect should be noted. The cold winters of 1916-18 seem to have been without any serious or remarkable erratic or violent weather. This was very different from the conditions during all the war winters from 1939 to 1942. Particularly severe was the ice storm of January 27– 29, 1940. The New York Times gave a general overview of this event (NYT, 28 January 1940), another reference is given by Cave . Reasons for this could be found in the larger area the war at sea already occupied as battleground, viz. from Murmansk to the middle of the North Atlantic, and the immediate and greater intensity when the Second World War started in autumn 1939. 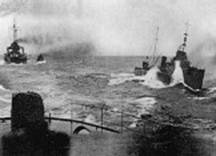 Compared with this period, the WWI war at sea (1914-18) was closely confined to the seas around the British Isles. And although all these coastal waters are part of currents, permanently moving northwards, the war probably was forceful enough to cool the water down quickly and lasting enough before the water disappeared in the Norwegian Current. The next section will deal with the cooling of sea surface water. In 1935 Lumby published a table showing fluctuations in the mean annual surface temperatures and salinity in the English Channel from 1903 to 1927. From 1901 until 1914 the temperature varied on a narrow band from 11.5°C to 12.2°C. From 1914 to 1917 the temperature dropped to its lowest point of the series, viz. 10.9°C. This table alone is certainly not sufficient enough to draw any in-depth conclusion. But it is enough to point to the fact that the Kaiserliche Kriegsmarine operated fairly often in the English Channel. The drop in temperature need not be a mere coincident. From Dover to Bournemouth the British had laid numerous small mine fields at most of the approaches to their Channel ports. The period of low sea surface temperatures fits perfectly with sea war activities in the Irish Sea and the Western Approach during WWI. Actually, the temperatures never dropped below 10°C until 1950, except during WWII. The year 1940 had an annual means of 9.94°C. As there is no immediate indication that the weather during WWI years ran ‘out of order’ as in the three war winters of 1939/42, no further investigation has been made. Nevertheless, as the work advances it is not impossible to find some ‘signals’ pointing to weather modification during the years 1914 -1918 in the Baltic, too. The Baltic Sea had not been left undisturbed. Several ten thousand mines were laid in the eastern part of the sea. 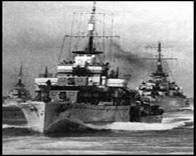 A number of fierce naval fighting took place. British submarines operated quite successfully in the area. The extent of ice coverage during winter 1916/17 seems to have similar roots as the extreme ice winters of 1939-42. As for the winters of 1916/17 and Spitsbergen 1918 it should not go unnoticed that even in the Barents Sea military activities at sea took place, when the Germans laid mines in the White Sea, to make the Russian supply for port Archangels unsafe. British mine sweepers arrived at Murmansk to assist in sweeping, as huge quantities of ammunition, stores and fuel were sent to Murmansk during 1917. 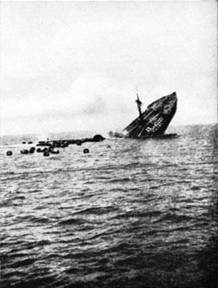 And the operations did not go by without losses. One case was the trawler John High, which blew up in a minefield in August 1916 . According to the assessment by Nusser of Germany’s coastal waters and based on the number of days with ice observed, the winter 1916/17 ranked 9th among 44 other winters from 1903 to 1947, while 1917/18 ranked 15th and winter 18/19 ranked 17th. In summary none of the three winters shows anything significant. Only the winter 1916/17 is noticeable, but does not match the WWII figures . There is little to conclude from these figures. The maximum ice cover possible north of latitude 57° North is 420,000 square kilometres. This coverage was observed only in 1940 and 1942 after 1917. The ice winter of 1917 ranked 3rd since 1894 . 1910 (5.7); 1911 (2.4); 1912 (31.5); 1913 (7.4); 1914 (6.0); 1915 (6.1); 1916 (7.3); 1917 (44.9); 1918 (15.3); 1919 (11.6). In summary, it is not a mere probability ‘out of the blue’ that military activities in the Baltic Sea during the war years 1914 to 1918 contributed to the ice conditions in the northern part of the Baltic. Between 1900 and 1914 ice conditions were moderate to heavy but changed to very heavy with the first WWI winter of 1915 and remained so for the next two war years of 1916 and 1917 . The winter of 1915 is regarded as one of the heaviest known, allowing only 50 days of shipping under severe conditions, in place of about 100 days in previous years. Particularly ‘extraordinary ice conditions’ for shipping were observed at the Boar Islands (mid-way between North Cape and Spitsbergen). In 1916 the west coast of Spitsbergen was blocked by ice; Boar Island was ice-free until October 1916 due to predominant NE winds. In 1917 the ice conditions in the Barents Sea were inconvenient, the ice border was unusually far south, occurring rarely and was therefore difficult for transport ships. Even a very short review of some principal weather conditions during WWI indicates that this period still may hold a number of clues to link certain weather conditions to activities of the war machinery at sea. The most striking aspects are the significant cooling of Britain in winter 1916/17 to a quite close level as in the arctic winter of 1939/40, continuing until the end of the war and also matching sea ice conditions in the northern Baltic Sea. However, what is most striking are the highly simultaneous snowing conditions in SE England during WWI and WWII, having all the ingredients in proof of the thesis, that the war at sea had modified the weather in a very significant way. A further hot topic is the cold sea water in the English Channel and Irish Sea.